Attorney at law with many years of experience. 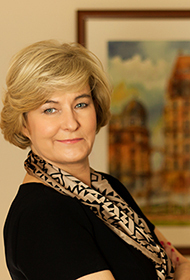 Founding partner of E. Guzowska, K.J. Kawecki Law Firm. Partner in E.Guzowska, K.J.Kawecki Law Firm (since 2001 r.). In the Law Firm, responsible for legal counselling on commercial, civil and financial (factoring) law and handling French companies’ investments in Poland. Member of the Paris Bar list of foreign attorneys. Other: Legal advisor of many domestic and foreign investors, French-speaking investors in particular. Has rich experience in providing services to corporate clients. Successfully conducted many capital transactions and mergers and acquisitions. For many years has been providing services in factoring transactions, both domestic and foreign. Experienced in legal institutions of French law, also in legal audits of French companies for Polish investors. Provides her services in Polish, French and English. Entered in the list of arbiters of Court of Arbitration Lewiatan in Warsaw, handled arbitration cases in three-arbitrators panels and as a sole arbitrator.